Android and cross-platform games in the future (Android, iOS and Windows). Check out our latest offering, Slide Puzzle (with a twist) for Android. Also available is our first offering, Flip Off for Android, available in both a paid version and a free with ads version. Slide Puzzle (with a twist) is a version of classic slider puzzle. The object of the puzzle is to place the tiles in order by making sliding moves that use the empty space. There are three different puzzle sizes - 3x3, 4x4 and 5x5. You can play either the classic style or a picture based puzzle with a provided image or choose your own image from your phone. This game can be as easy or as challenging as you wish it to be. Not only can you play with only 9 to 25 sliding tiles, but also you can remove the numbers from the picture tiles and, for an even greater challenge…the TWIST…you can make the pieces rotate. This is a great game with an almost infinite number of possibilities for play for hours of fun. This puzzle is ad free and safe with almost no special permissions required. No data mining. Flip Off is a fun way to covertly give your friends the bird. 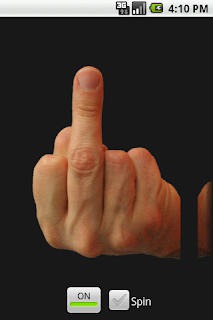 You can flip them off whether they are near or far! Send via text message or Skype, tweet it, post to Facebook or Picasa, or send in email. Send one to your favorite iPhone user! Uses installed messaging or social media application to send the current flip! Your standard message & data rates apply. Change to next flip. If Random is selected then a random image will be displayed, otherwise they will be displayed in order. If the displayed flip has spin enabled then the flip will spin again! Select which Flip images you want shown when you swipe and choose whether or not the image spins! "Portions of this code from Professional Android 2 Application Development, ISBN: 978-0-470-56552-0, copyright John Wiley & Sons, Inc.: 2010, by Reto Meier, published under the Wrox imprint are used by permission of John Wiley & Sons, Inc All rights reserved. This book and the Wrox code are available for purchase or download at www.wrox.com"
Portions of this code is licensed under the Apache License, Version 2.0. Thanks to stackoverflow.com for all of the questions people ask and answer there. Great help!